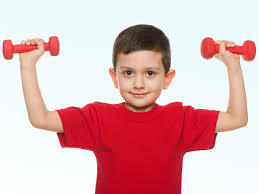 Children who do resistance training: - Energetic Juniors - Contact Us! Children should exercise in ways that they think are FUN. If your child likes doing resistance training with their parent, they should do it. If they don’t, they shouldn’t. The most important thing is that they form positive, happy associations with exercise at their age. Children should be allowed to try any type of exercise that seems interesting to them, but not be forced into any specific kind. There are quite literally an infinite number of ways to exercise and be fit; nobody has to do any specific workout that they do not enjoy, child or adult. As anyone who spends enough time with children will know, kids will always find ways to do the activities that they enjoy, and that’s key, because in the end, all that matters in terms of exercise is that it happens and that it is consistent throughout a person’s life.